That old saying “April Showers Bring May Flowers” has me a little nervous. It’s not that there’s anything wrong with May flowers. May flowers are great. But after showers and then some throughout all of February and March, Whidbey is already looking like the land of 1000 lakes. We’re easing toward spring though. There are signs that all will be well. The neighbor’s plum is blooming, my hellebores are in bud. The sun comes out some afternoons, just in time for a stroll on the beach. But it’s still a bit cold. This morning, bundled in a blanket, a space heater warming my toes under my desk, I’ve been watching the news from Japan. They’ve learned something about the joys of abundance recently. 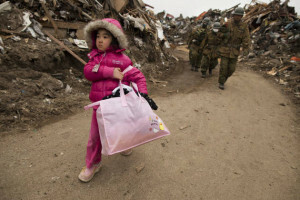 In shock, I’ve viewed hundreds of images and watched many videos of the Japan tsunami disaster. One film showed a trickle of water running down a street, which became – in only six minutes – a raging cataclysm that swept entire buildings away. Another showed the grounds, lawns and walkways of Tokyo’s Central Park – which is built on fill – oozing, cracking and bubbling, water geysering up in places. Segments of ground on opposite sides of a crack were moving independently, a bit like the platforms of adjoining railroad cars. We’ve got so much. A whole earth. And it’s wonderful, and it’s enough. Or it should be. If only we could respect it and leave it alone. If only we could stop trying to bend the earth to our will, diking off the sea, reshaping the Mississippi River, building important structures like hospitals, nuclear reactors and homes on fill, in the path of floods or in old river beds. If, after watching this disaster, Seattle goes ahead and builds that tunnel through ground filled in by the Denny Regrade … well I don’t know what. During economic hard times, states, cities and counties close their parks to save money. That’s just silly. It’s open land. You can’t close it. What are you going to do, fence it? How much will that cost? But you can let it be. You can stop manicuring it. Stop lighting it, close the restrooms. Stop paving every bloody inch of pathway. People need that open land. Let them use it at their own risk, the way wilderness has always been used, until these last few overly careful years. But teach them to use it sensibly. Here on Whidbey volunteer groups already watch the beaches, clean up trash and maintain trails. Volunteer groups, user’s groups can do the same for parks, and they will. It’s time we all pitched in again, took pride in and maintained our public lands rather than expect that someone be hired to do it for us. It’s nice to have help, but it’s not necessary to keeping a park working. If we spend time in the un-engineered outdoors we learn how it works, how to work with it, and how to let it be what it is, without interference. Roosevelt didn’t say “Nature is the home team, and nature bats last,” but I can imagine him liking that line.